Rain kept us indoors most of the weekend sadly. But I could look outside and see that spring was inching its way closer to us and I was anxious to get a closer look. In the meantime I had to keep myself busy with inside projects like painting our orange bathroom. We ended up painting over that with a sort of sky blue color. Turned out pretty well. I didn’t take any photos of it so you’ll just have to take my word for it. Early Sunday afternoon the rain finally decided to move on. The sun even peaked out a time or two. I convinced Susie to join me for a stroll down the trail to see how it’s changed over the last two weeks. And this time I planned on taking my old D40 with me to see. First I wanted to see if I could remember how to use it. Second I wanted to see how it compares to the photos I’ve taken with my phone. Turns out I only vaguely remember what I’m doing with a DSLR. You’d think I’d remember something of what I learned during my year of photography, but you’d be wrong. Still, even though it’s a little long in the tooth, the D40 makes for much better photos than my iPhone I think. 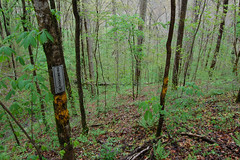 Anyway, as we made our way down I was again amazed at how much things can change in such a short period of time. 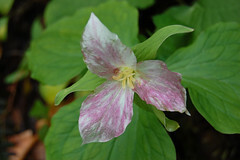 There were new wildflowers growing but the Trillium have really started to pop which distracted me for much of our walk. 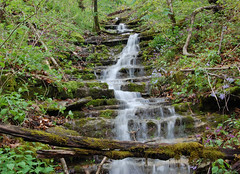 As soon as we entered the woods you could hear the water rushing down the stream at the bottom of the hill. Normally it’s just a trickle, but after a good rain there’s quite a bit of flow. And noise. I was hoping to get a decent photo (assuming I remembered how to work my Nikon). The photo on the right is the best I could do. Apart from letting my photography skills atrophy, it was still mostly overcast which didn’t help with the lighting. Ah well, I expect I’ll have more chances in the future. I took a few more photos, but not as many as I hoped since my battery was not quite as charged as it led me to believe before leaving the house. I put those that were halfway decent into an album on flickr. I have some others from around the house over the last year that I plan on putting in that album as well at some point. It’s on my list.